LEFT BANK VILLAGE. CORPORATE SPACES. TRANQUIL. VERSATILE. The Left Bank Village has eight different corporate spaces of different sizes. Combining beauty and functionality, The Left Bank Village is in the heart of the city but tucked away from the hustle and bustle of the high street. So you will find our spaces calm and peaceful and the perfect environment for focused conversations and activities. Wye Valley Trust, Herefordshire Council, Bulmers and Hereford Waitrose are just some of the local organisations and businesses that hold corporate events in our spaces at The Left Bank Village. We can provide catering to suit your needs, that fits in with your schedule, such as tea and coffee refreshments or a light corporate lunch. For more in depth details about our catering options, please visit our catering page. Click here. 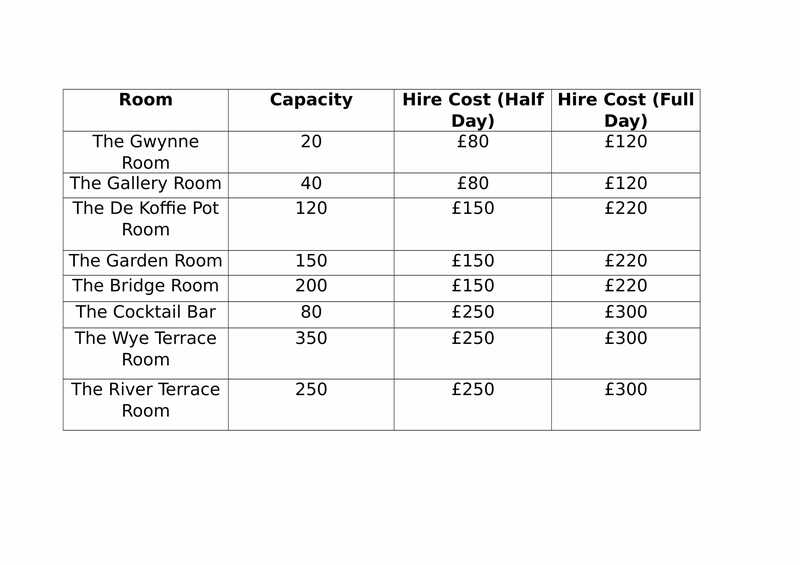 For the prices of our different corporate spaces, please see the table below. A half day is considered to be any length up until 5 hours and a full day is considered to be any length between 5 and 10 hours. To book a viewing for corporate hire, please email us at enquiries@herefordleftbank.com or call us on 01432 357753.